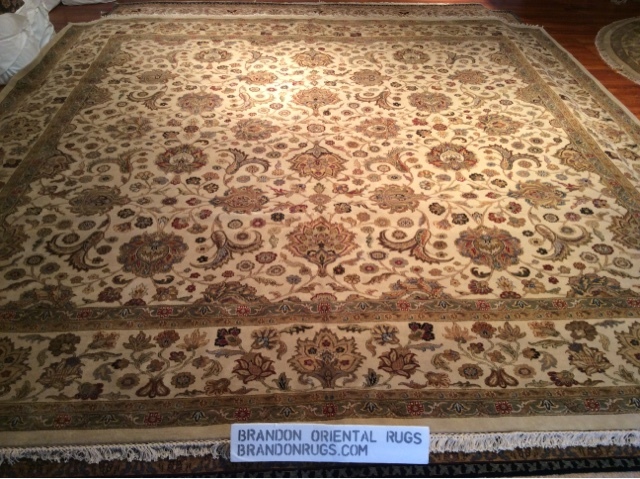 Bucks County, PA rug store Brandon Oriental Rugs (www.BrandonRugs.com) custom installs custom fitted hand-knotted oriental rug runner with custom machined brass stair-rods in home custom renovated by our customer. 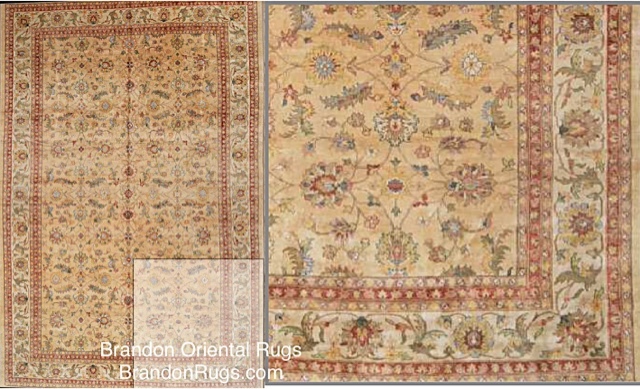 The image shows the proper way to install an oriental style rug on a stairway. 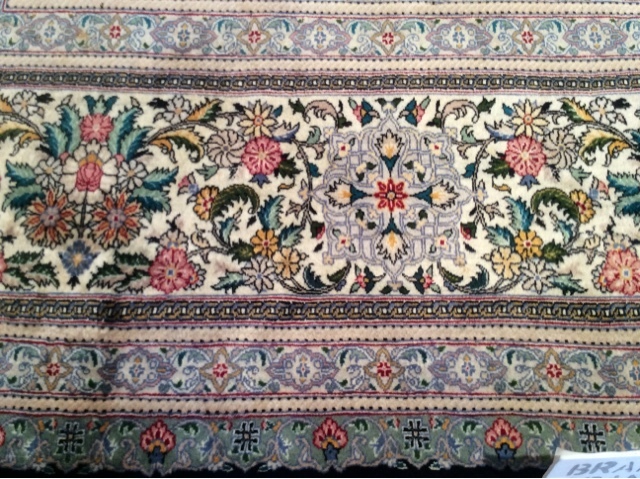 Notice that (unlike commonly available "roll runners" which are bordered only on the sides) a real handmade runner is like a beautifully framed picture with borders on all sides. 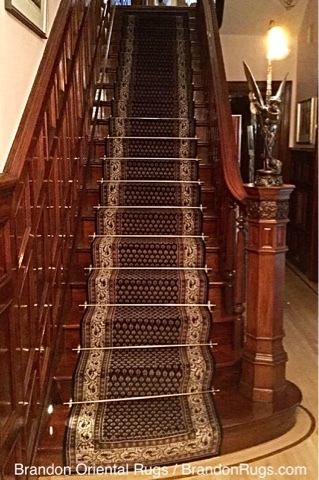 Also, notice that runner has been custom fitted for the stairway on which it is installed: it begins under the nose of the landding above, and cascades downward to a perfect finish at the junction of the riser of the first step and the floor. 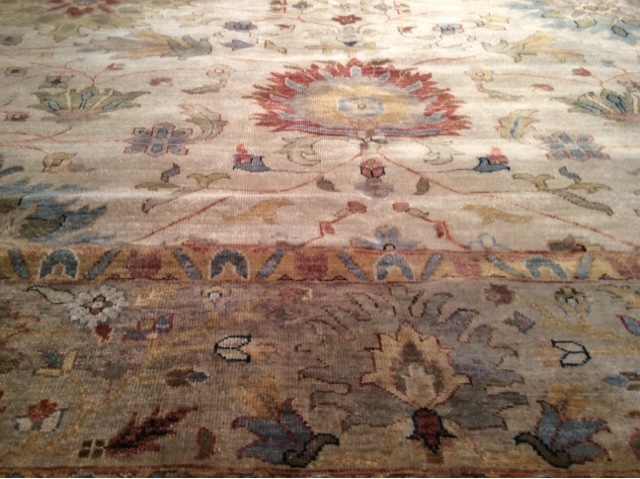 This rug was originally two identical ("sister") runners joined together and then specially cut to fit the entire length of the stairway with extra work required to fit the two curved stairs at the bottom. 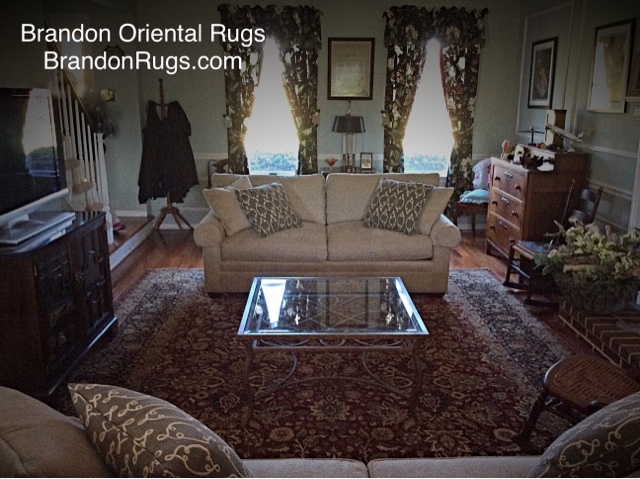 The solid brass rods are made with custom turned finials cut directly onto (not screwed onto) the ends of the rods. 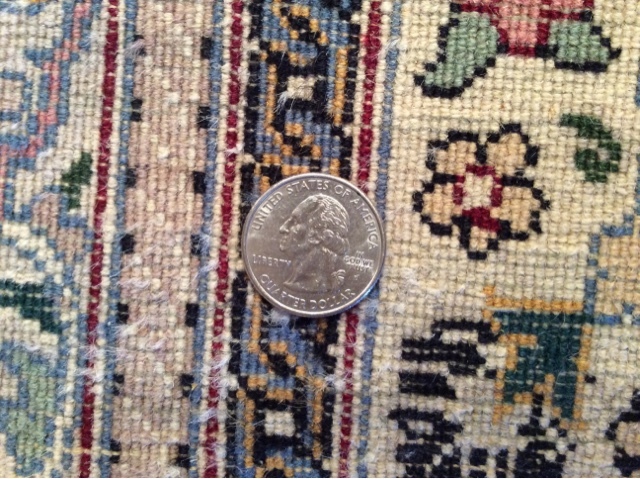 This, in toto, was not an inexpensive solution or easy installation. 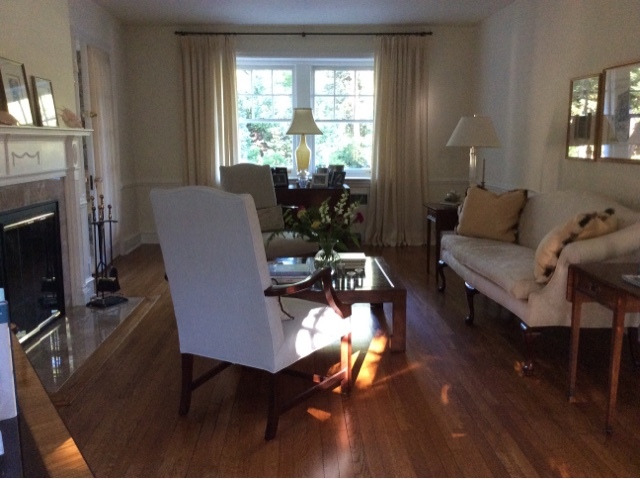 Considering the superb renovation undertaken by our customers with the utmost regard for the legacy of their home, nothing less was ever considered as an option. 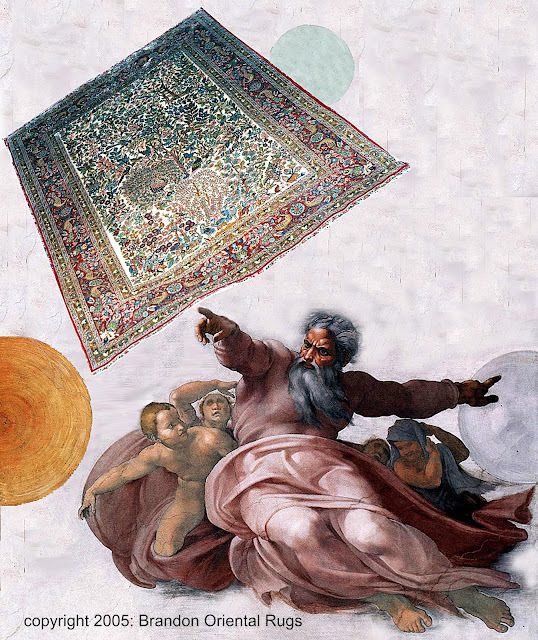 Well done all around. 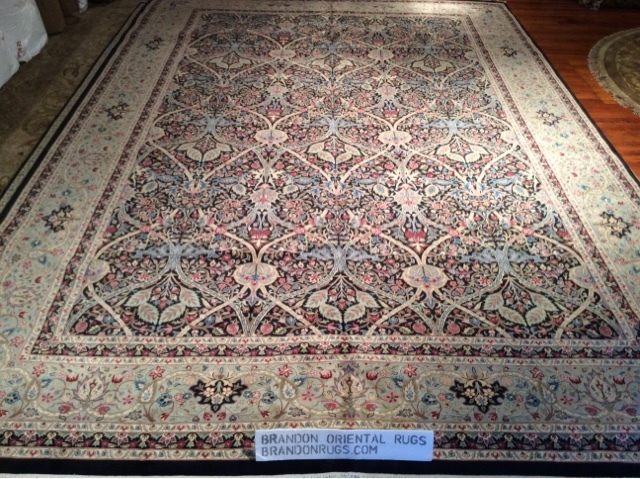 About the time that your universe begins to take form, you might want to consider putting real handmade oriental rugs from Bucks County, PA oriental rug store Brandon Oriental Rugs into your creation. 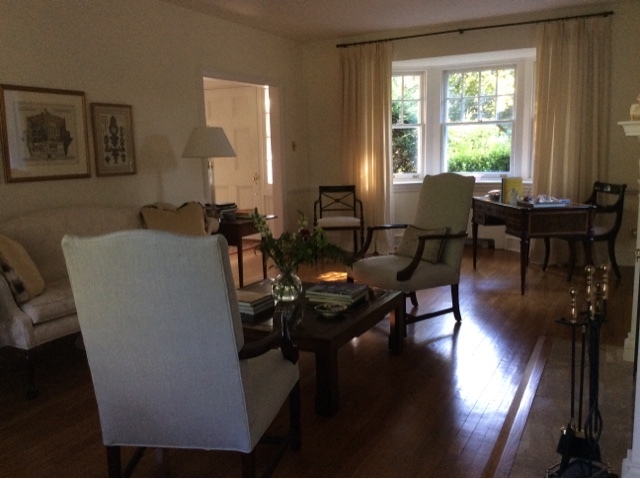 For all of the wonderful spaces you are planning, and for all of the days to come when you will be enjoying all of your beautiful plans, you will see that it is GOOD. Brandon's customers are engaged in a long-term redecorating project throughout their Buckingham Township home. 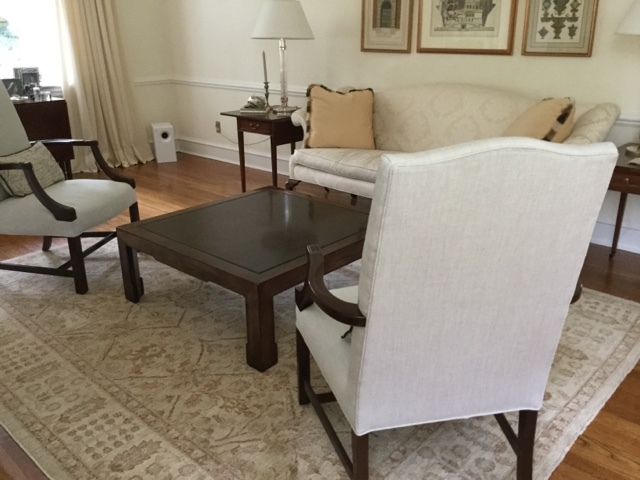 Seeking to better unite new facing sofas in the living room, they opted to transfer an old rug that had been in the room to another room of the house, and search for something really special for this area at the center of their home. 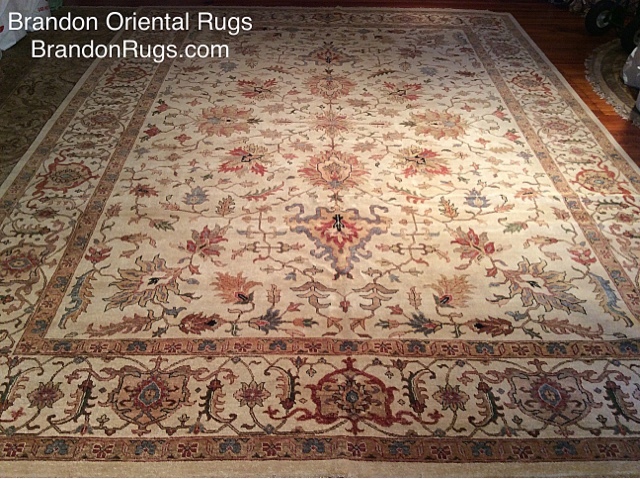 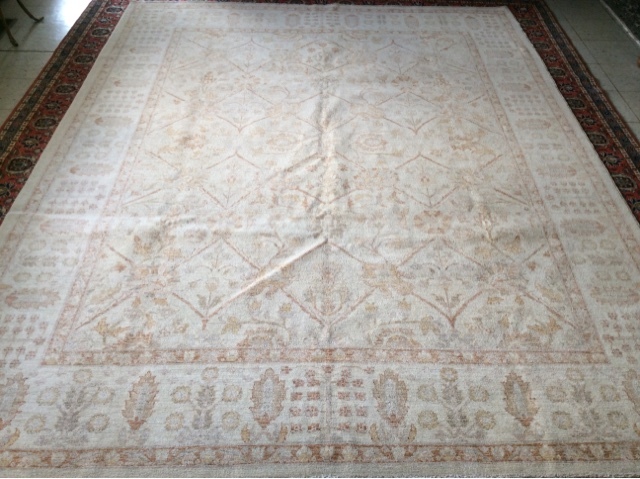 The rug selected is a 10x14 reproduction Hadji-jalili Tabriz style rug made in India. 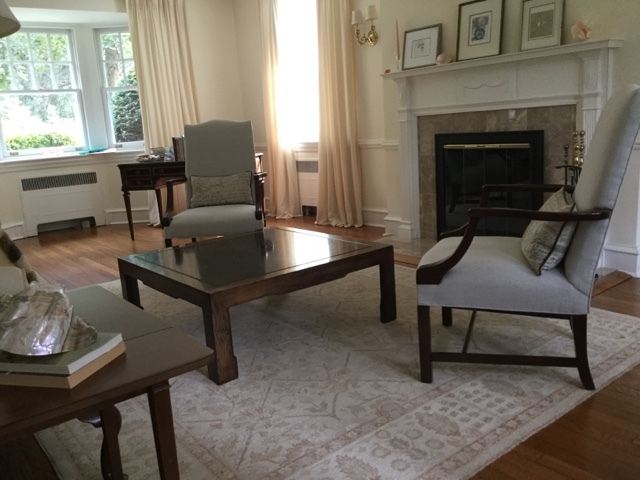 While originally looking for a rug with a black background, the homeowners decided that the radiant warm red tones of this rug provided a needed and welcome balance to the subliminally cool feel of their room caused by the pale blue paint color on the walls, the linen white and gray colors on the sofas, and indirect natural light imparting a grayish rather than yellowish cast to the room throughout most of the year. 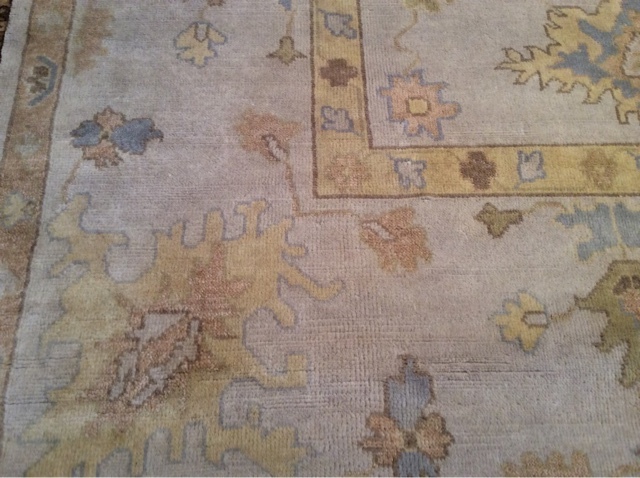 The photos above and below show the richly variegated vegetal dye palette and the hand-spun wool textured detail of the rug. 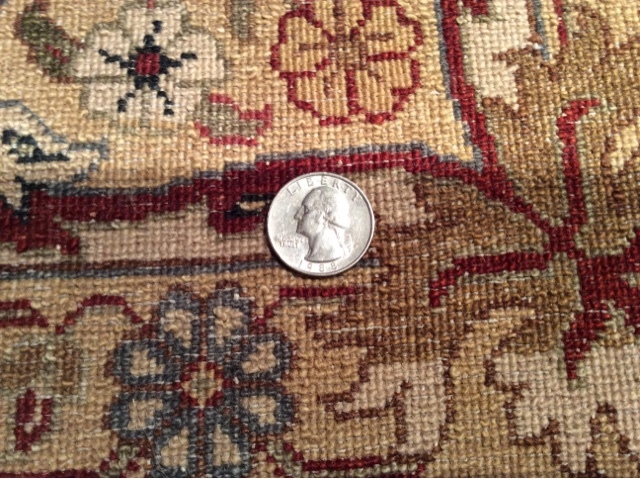 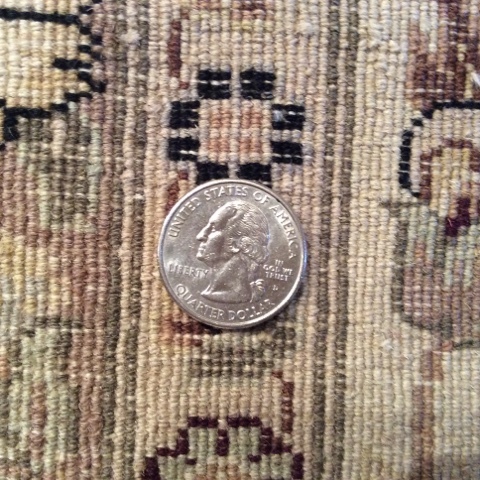 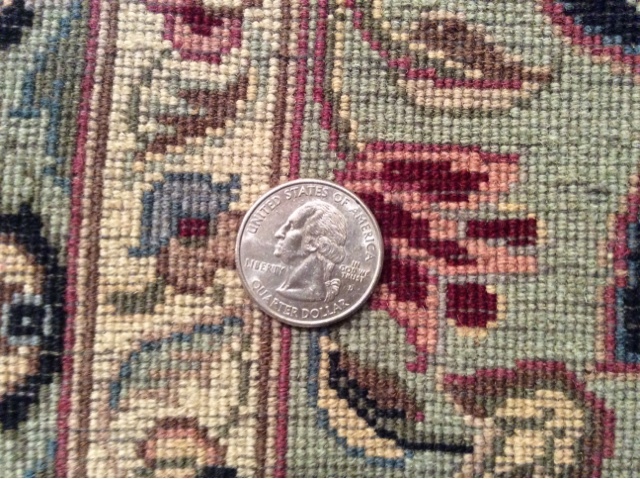 The image below (showing the back of the rug) uses a US Quarter Dollar as a one square inch reference standard. 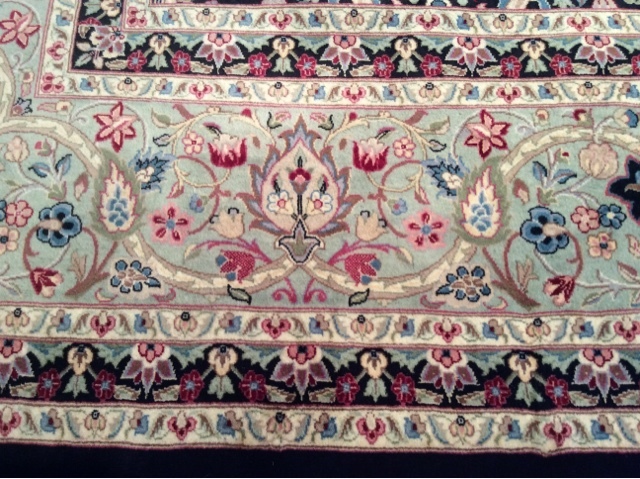 It is clear to see that the rug is produced according to a 14/14 contract: there are fourteen knots horizontally per linear inch and fourteen vertically. 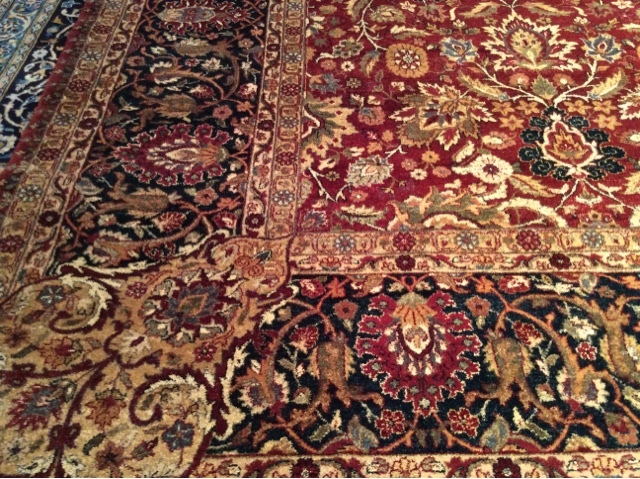 Multiplying yields a knot density of 196 hand-tied knots per square inch. 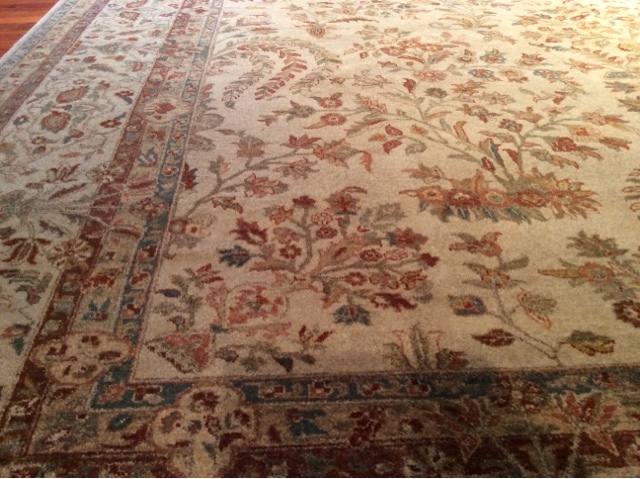 A ten foot wide by fourteen foot long rug with this level of detail requires a total of over four hundred person days of labor to produce. 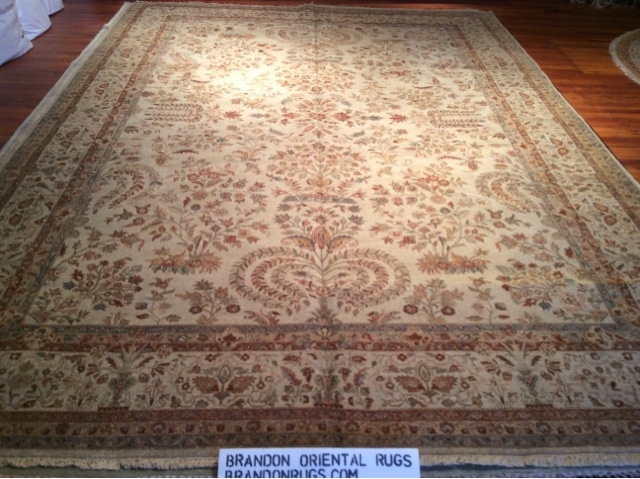 Needless to say, Brandon's customers have chosen a rare and valuable work of art to grace the floor of their home's living room. 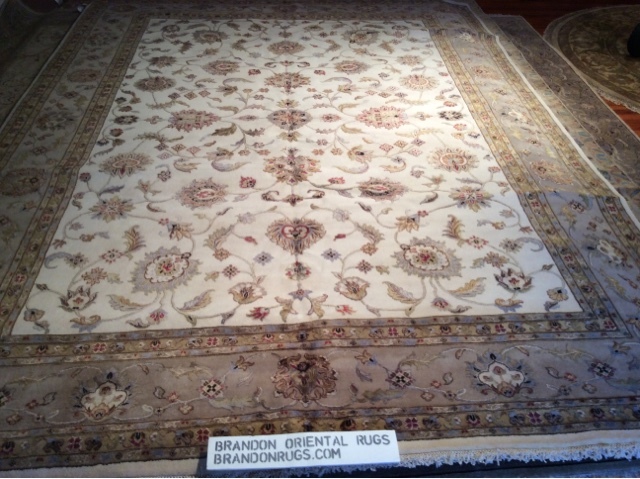 Customers of Bucks County, PA oriental rug store Brandon Oriental Rugs were looking for a handmade runner for a small hallway connecting the master bedroom suite with the rest of the second floor of their Doylestown, PA home. 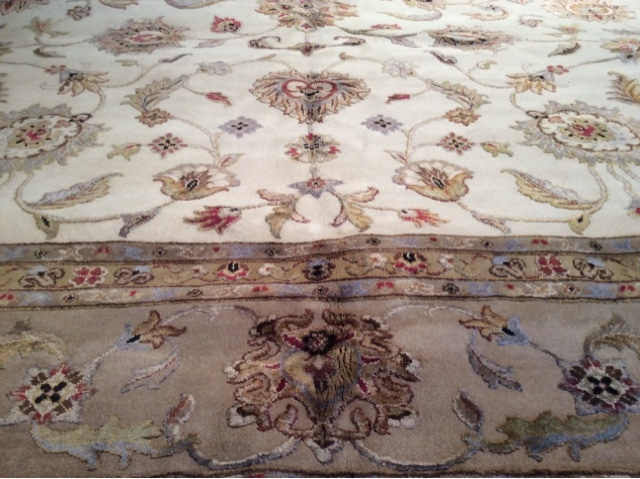 Working with their designer, they selected a Turkish Oushak design reproduction runner made in India. 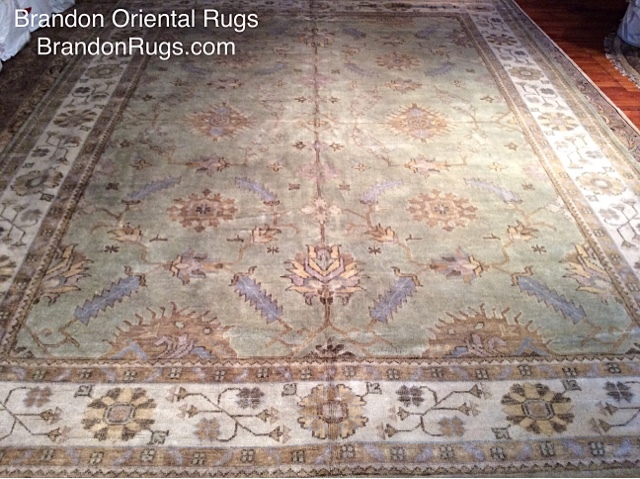 The muted palette and soft texture of the rug are a perfect complement to the light, airy look and feel of the bedroom beyond. 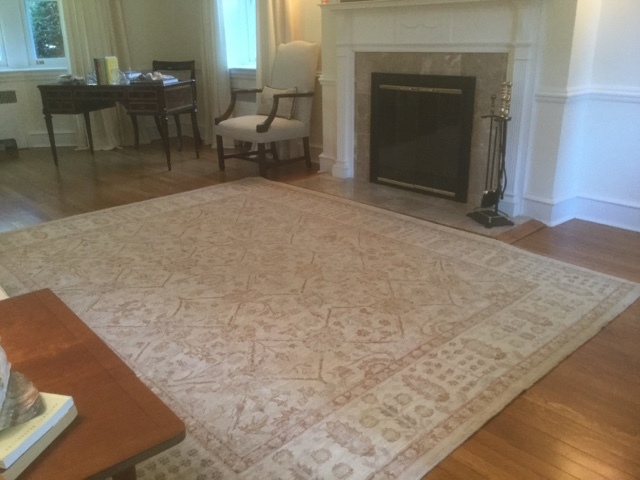 Big plusses realized from the use of the rug were a noticeable reduction in the echoing noise produced when traversing the formerly bare floors; and the comfort and warmth underfoot when passing barefoot through the hall to use the walk-in closet/dressing room on the left or the bathroom on the right. 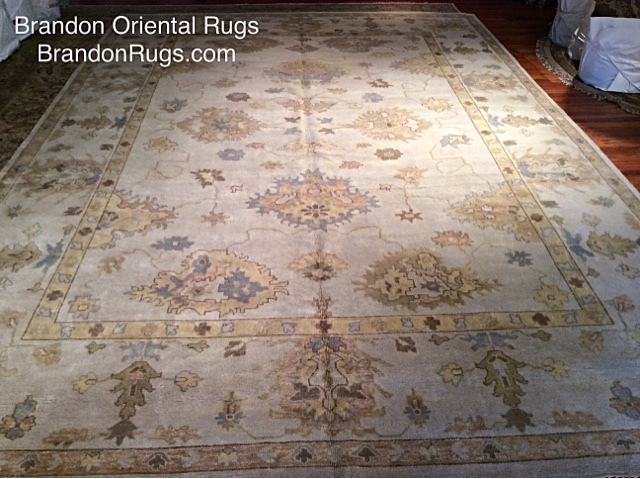 are looking at the right rug for the room or area you are decorating. 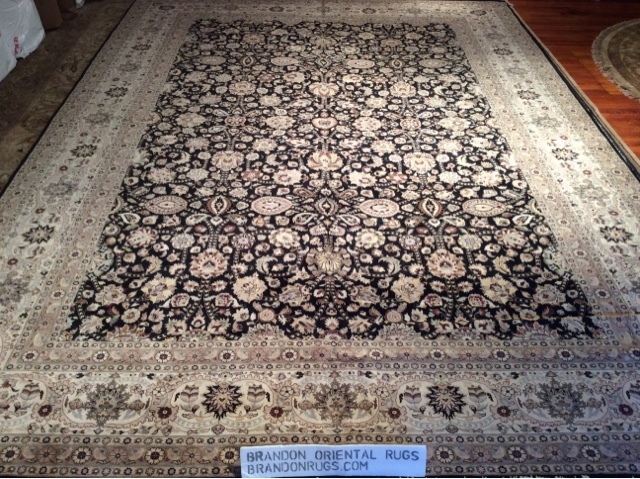 Unlike stores that maintain a lot of random inventory based on best guesses about what the next person through the door will want, Brandon Oriental Rugs custom selects all of our rug inventory in response to individual customer requests related to specific, unique needs. 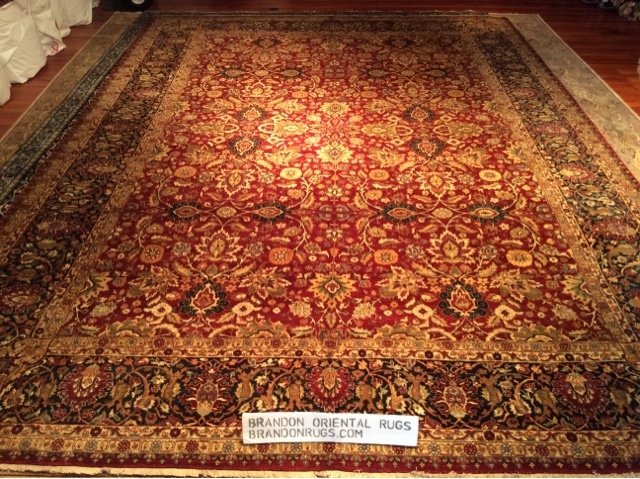 Based upon a set of search parameters presented to us by each customer, we bring as many rugs from our manufacturers, importers and suppliers as are available and appropriate in response to the specific need. 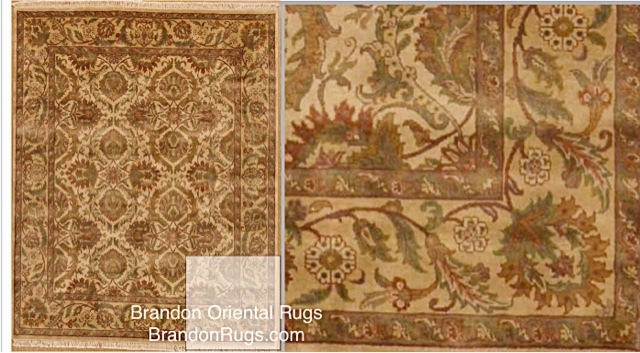 Below are some selections brought in response to two specific search requests in recent days. 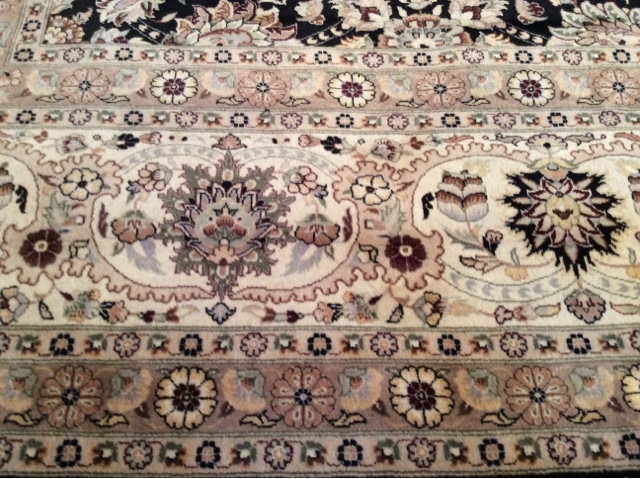 Any rugs not chosen by the customers for whom they have been brought for consideration are available to all others who share similar needs. 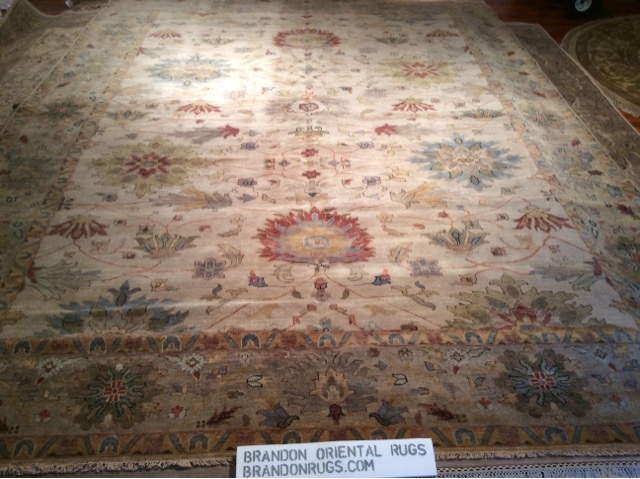 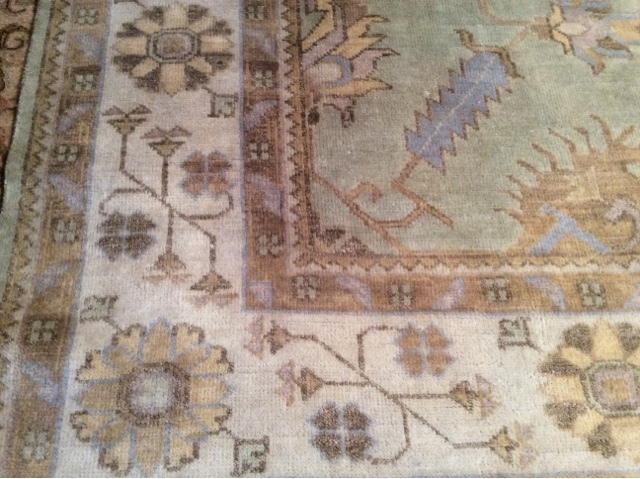 All rugs are available for preview at our store and for in home trial. 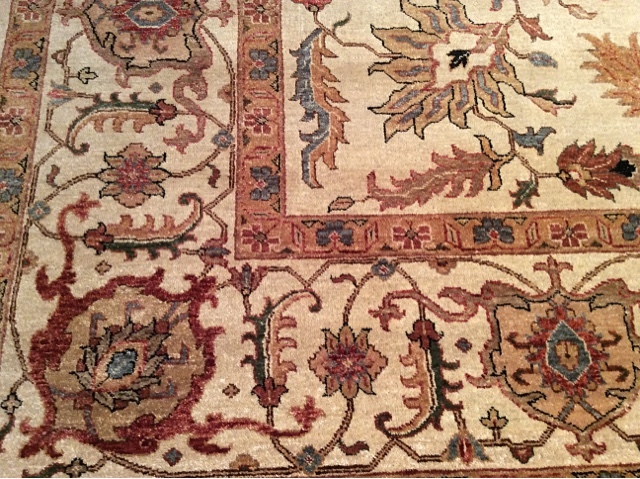 If you have questions about anything you see here, or on any of our other social media platforms; or if you have a special rug you need help finding, we invite your inquiry.